Tequila Adult Costume.Age Category - Adult.Includes: Liquor pull over Tunic.Available Size: Adult Standard - One Size Fits Most Adults. *Shirt, Pants and Shoes Not Included.One Size - Standard: Height (5'8-6'3"), Waist (35-40"), Chest (42-48"), Outseam (41-46").Get Drunk with this costume..Costume features a tall b ottle of tequila with bottle neck and cap as a headpiece.A little South-of-the-Border flavor to spice up any shindig! Santa Eyebrows.Includes: One pair of self adhesive Santa eyebrows. *Costume and Accessories Not Included. 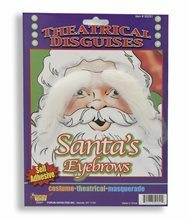 Sold Separately.Dress up your costume with these Santa eyebrows. Santa Claus Wig and Beard Set.Includes: Santa Claus Wig and Beard.Available Size: One Size Fits Most Adults. *Costume, Glasses, Gloves, Eyebrows and Bells Not Included. Sold Separately. 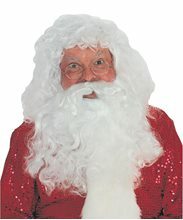 Santa Claus Beard and Wig Set.Includes: One Santa Claus Beard and Wig.Available Size: One Size Fits Most Adults. *Costume and Accessories Not Included. Sold Separately.Ho! Ho! Ho! 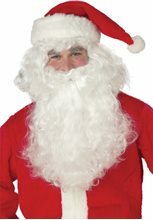 Become everyones favorite person with this classic Santa Claus beard and costume wig with your Santa Claus costume. 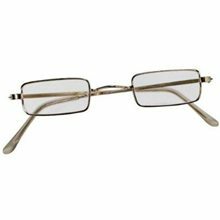 This costume accessory is very versatile and goes great with any winter costume. Make your costume character more realistic with this classic santa costume wig. Pair this amazing adult costume wig with any winter costume, Santa Claus costume, or any Saint Nicolas costume! 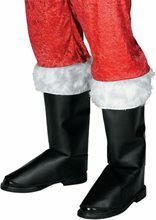 Deluxe Santa Boot Tops.Includes: One Pair of Deluxe Santa Boot Tops.Available Size: One Size Fits Most Adults.Features one pair of Deluxe Santa Boot Tops with white furry cuffs. 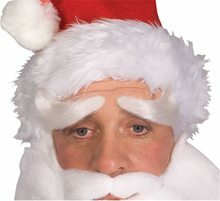 Santa Deluxe Eyebrows are made of 100% Teviron and built into a net foundation.Santa eyebrows are white in color.It includes one pair of santa eyebrows. 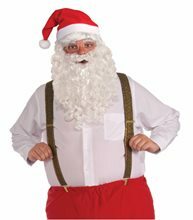 Santa Suspenders.Includes: One Set of Santa Suspenders.Available Size: One Size Fits Most Adults.Material: 95% Polyester / 5%Polypropylene.Care Instructions: Hand wash with cold water and mild detergent. Line dry. Do not bleach. Do not iron.WARNING!! : CHOKING HAZZARD - Small parts. Not for children under 3 years. Keep away from open flame. Not intended for children under 14 years of age.Made in China.